Just as the title has way too many “B’s”, Best Buy believes it has too many upper-management positions in their organizational structure. With the company’s stock hitting a 10-year low recently, Best Buy believes leadership and organizational roles must be revamped to turn Best Buy back in the right direction. Best Buy used to be known as the place to go (sometimes the only place) for any and all electronic needs. They had been leaders in the consumer electronics retail industry. Unfortunately, Best Buy has been relatively slow and complacent in terms of evolving and innovating their operations strategy. However, competitors have leap-frogged Best Buy from all angles. The last few years have seen internet retailers like Amazon and other large retail stores like Wal-Mart and Target capitalize on Best Buy falling asleep at the wheel. Wal-Mart and Target have refined their operations efficiency enough to make them low-cost leaders. This is an essential part of why they can offer lower prices than many other outlets. They positioned themselves in consumer minds as the place to go to save money. Therefore, people figured if they save money at Wal-Mart for everyday items, the same must be for electronics. In addition, consumers also have the convenience factor of buying the electronics from Wal-Mart in that they could buy their groceries and other items there as well. Amazon is also a big reason for Best Buy’s decline. While Best Buy and other retailers have an online store, Amazon’s specialization in online retailing has Best Buy “against the ropes”. Amazon beats Best Buy through lower prices, higher product variety, fast shipping, and in many states, tax-exempt purchases. 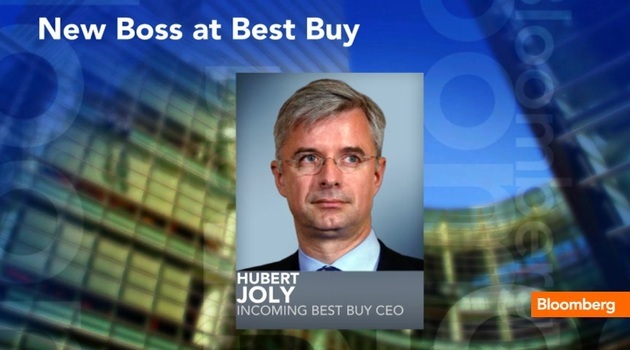 To stabilize the business, Best Buy’s new CEO, Hubert Joly, is condensing the management structure. They are cutting out high positions such as “President of U.S. Business” and “Chief Administrative Officer” organizing the company structure into three divisions. The heads of each division will answer to Joly directly. The reason behind the change is the hope that the company, can make a better connection to its functional-level employees (to be retrained as well) and customers. Best Buy has closed dozens of stores just this year and is reducing store sizes due to lack of in-store demand for certain products. With competitors doing the opposite, Best Buy’s relevancy to consumers is fading. It seems part of Best Buy’s sluggishness to be competitive had been a cumbersome organizational structure and the inevitable “bureaucratic red-tape” that hinders decision-making in an organization. In my opinion, this move by the newly appointed CEO is totally necessary for any long-term strategy to keep the company alive. However, I also feel it may be too little, too late for Best Buy to catch-up to its competitors. In the short-term however, I believe Best Buy will regain some traction due to the holiday shopping season and their new offer to customers of matching competitor prices on their items. Will Best Buy eventually recover and be competitive in the market, or are their days numbered? I do not think that Best Buy can recover. The changes will have a positive effect in the short run and might last a few years but places like Amazon with their no tax, cheaper prices, and large inventory they will not be able to compete. Best Buy would need to make drastic changes and have a new innovation to be able to stay in the market. The Geek Squad and service plan is something that cannot be replaced, where they have competitive advantage. I believe they should expand in that area because it will be more profitable for the future. I agree that Best Buy has fallen behind its competitors in the last few years. I remembered how I used to go to Best Buy for all of my electronics but now I do not. I could get a product with better attributes and still pay less than what Best Buy could offer me. So cutting back on expense and restructuring the company to regain its focus is a smart choice. I cannot say that this will help much since some companies do make a comeback. However, in the world of electronics and technologies, products become obsolete within a short amount of time (product life is short) so I don’t how Best Buy can get out of its trouble and regain their competitive advantage.